Happy New Year everyone!!! My internet connection is almost one month ng wala!!! Sobrang kakainis na ang Globe!!! Anyway, this post is regarding my Christmas celebrations that I had with the company. 1. 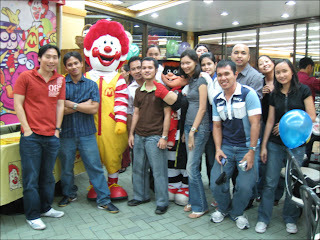 December 11 - It was our departmental Christmas party and we had it in Mc Donald's Greenbelt. We became children at that time... Expressing our inner childhood manner and was so delighted to see Ronald McDonald! Hehehe... The food was of course one piece chicken with spaghetti, burger, fries, as in the usual fastfood stuffs, but it was overflowing! I was also forced to join a game and thank God, I didn't have to dance or to do something nasty. The party was so cool and everybody really enjoyed it. On that day, what I received from exchange gift was 8 Century Tuna in cans! Really cool! Heheheh... I brought home with a souvenir of Misys umbrella. 2. 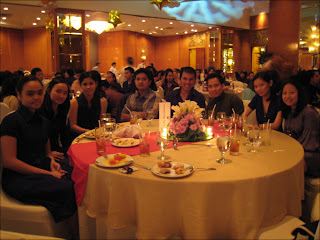 December 14 - Our company Christmas party was took place in Mandarin Oriental Hotel in Makati. Our theme was "Misys Goes to Hollywood". The performances that night were really great! Loved the Happy Feet presentation and our group did the White Chicks theme. This time, I was not a part of that presentation, I forced my teammates to make a contribution my holding some props on the presentation, hehehe... The food was a buffet and yes, I enjoyed it... Hahahah... I loved the beef lasagna and also the fish fillet, also the cheesecake was cool. 3. December 19 - It was our final gift giving that day and also it was a treat from Arleen and Harold who were celebrating their birthdays on the month of December. 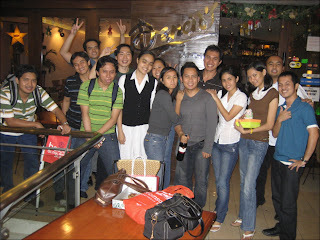 We had a super uber sarap na dinner in Dencio's in Paseo Center. What I enjoyed that night was Bangus sisig! I got an Adidas pouch bag and I loved it! Sobra! Hehehe... After the dinner, we went to The Coffee Bean and Tea Leaf to have a coffee of course. It was a treat from Ma'am Thet, there we had a super funny discussions and made a kasunduan regarding the next day's attendance. The last thing to arrive in the office will make a merienda treat! Hehehe... SUch a funny idea but everybody participated and enjoyed it!